You can't swing a dead cat at the Archery Trade Association Show without hitting someone who is looking to make it big on outdoor television. It's not just at the ATA Show either. At pro shops, big-box stores, or just about any archery-related event, someone will pass through who is trying to be a television star. I'd say there is nothing wrong with this, but that would be a lie. Don't get me wrong. The ability to make a living as a television personality is one thing I love about this country. However, I also cringe at the ability we all have now to film our hunts, and then disseminate them for the world to see. Making bowhunting a spectator sport is not easy. What can be easy is showing something that offends the masses, which includes our most important allies — the non-hunting crowd that still condones what we do. Some hunters say that's okay and that we shouldn't shy away from what we do. To an extent, I agree. But I'm also a big fan of discretion and tact when it comes to how we put ourselves, and our sport, on display. Of course, not everyone who totes camera gear into the woods is looking to be the next Tom Miranda or Fred Eichler. Many folks are just looking to capture cool footage of their hunts, or maybe preserve forever their son or daughter arrowing his or her first deer. 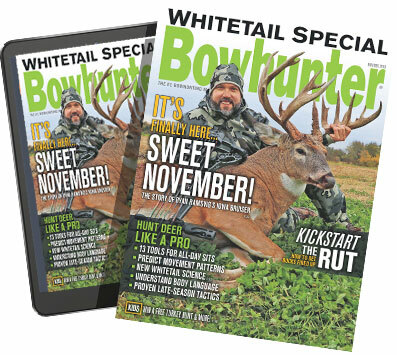 Many folks who film hunts have no aspirations to achieve anything other than a record of their season in a treestand or turkey blind. Whatever the case may be, there is no question that the self-filming market has exploded in recent years. In fact, finding quality action cameras to mount on a bow and film a hunt only a decade ago would have been difficult. Today, not so much. Heck, our smartphones are good enough to film hunts with, if we're looking for nothing more than a decent video. I'm of the humble opinion that one of the best reasons to strap a camera to your bow is that you'll have a true record of what happened during the shot. Forget about becoming a celebrity, and just think about being able to watch your arrow hit in slow motion, which offers a huge game-recovery advantage. In the heat of the moment, we often lose our heads and don't really know what happened, although we usually think we do. A bow-mounted video camera can tell you exactly what happened, which is the first step in deciding how to proceed after the shot. In states where it's legal, a bow-mounted camera and arrows fitted with lighted nocks are an even better option. That way you'll have the best idea possible of exactly where your arrow impacted, how the animal reacted, and what you should do to recover it. A camera can show you that the perfect double-lung shot was actually five inches farther back, meaning an immediate blood-trailing effort should be put on hold for four or five hours. That information is invaluable. If you've got the self-filming bug, or are looking to ensure the best chance for recovering arrow-hit game, there are a number of options worth checking out.